The Arctic tundra has a reputation for being cold and inhospitable – and it's true that for much of the year, this is a land of wind-driven snow and drifting ice. But a number of animal species and Arctic plants have adapted to not just survive but thrive here, with more migrating to take advantage of the brief but glorious Arctic summer, six to eight weeks of endless sunlight, growth and bounty. The Arctic spans northern regions of Alaska, Canada, Russia, Greenland, Iceland, Norway and Sweden. 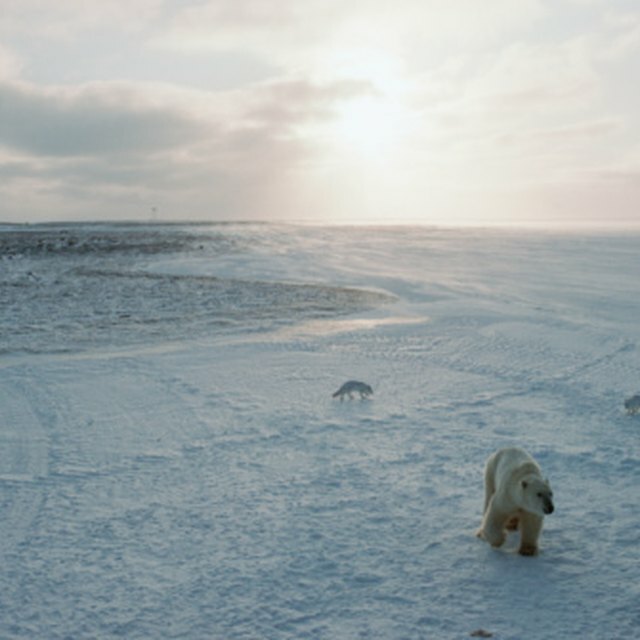 The most famous mammal of the Arctic is, without a doubt, the massive white polar bear. 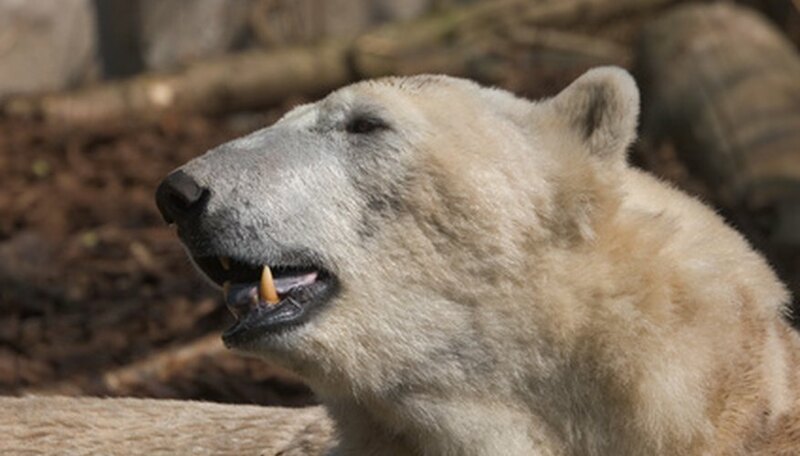 The polar bear is often credited as the largest land predator in the world, but you might be surprised to hear that it's actually a marine mammal. That's because although pregnant females birth their cubs on land, in dens dug out of snowdrifts, polar bears otherwise spend most of their lives on Arctic sea ice. That's where they hunt for their favorite food, seals. As Arctic sea ice shrinks and recedes from land, polar bears are spending more time on the coast. This sometimes leads to interbreeding with the grizzly bear, which lives in the open tundra and the mountains, eating everything from caribou to small mammals, berries and buried roots. Finally, the smaller, shyer black bear is also found above the Arctic Circle, although they tend to stick to forested areas further south in the Arctic. The Arctic tundra is home to another magnificent land predator, the gray wolf, sometimes called the timber wolf. There are two distinct subspecies of the gray wolf in the Arctic: The snow-white Arctic wolf, which has a shorter muzzle and smaller ears to conserve body heat, and the brown-to-gray tundra wolf. Both wolves live and hunt in packs that are led by a dominant mated pair. These dominant wolves are the only ones who breed, with the other adults pitching in to help raise the pups. Both wolf species hunt a combination of large animals, including musk ox and caribou, and smaller animals such as Arctic hares, lemmings, birds and ground squirrels. But because permafrost – a type of permanently frozen ground that is common throughout the Arctic – keeps Arctic wolves from digging dens, they usually live in rocky caves or outcroppings. One of the most numerous animals in the Arctic is the caribou. Sometimes caribou herds can contain hundreds of thousands of animals, traveling together between spring calving and feeding grounds and more protected winter feeding grounds, usually in the forested southern reaches of the Arctic. During the summer, caribou feed on the leaves of tundra plants like shrub willows. During the winter they switch to a diet of lichens, moss and dried grasses. The caribou's fur is made up of hollow hairs, which trap air and keep the animals very warm. The caribou's fur also gives it a lot of buoyancy, a big advantage when it comes time to cross a frigid Arctic river. Because a caribou hide is so light and warm, they are prized for traditional clothing by the Indigenous people of the Arctic. The Arctic is home to Arctic hares and Arctic foxes, which both shed their white winter coats in favor of a gray, brown or even blueish summer fur. And finally, you'll find many birds in the Arctic too. Most of them migrate north to feed and breed during the summer, but a few have adapted to stay here year-round. These include the snowy owl, which is active by day and lives in the ground; and the willow ptarmigan and rock ptarmigan, which both molt between white winter feathers and patchy brown mottling in the summer. If you've ever seen pictures of blowing snow on the Arctic tundra, you might be shocked to know that there are tiny plants under there – quite a lot of them, in life. The Arctic is rich in plant life, but most of the plants living on the tundra have adapted to the Arctic environment by growing small, close together and low to the ground. Some of them also grow fuzzy or woolly coverings that help keep them warm, and produce cup-shaped flowers that face up to the sun, concentrating the sun's warmth in the center of the flower. Some common flowering plants you'll find in the tundra include the bright pink petals of purple saxifrage, the fuzzy prairie crocus, the lovely Arctic poppy that swivels to face the sun, and moss campion, which sports a profusion of tiny pink flowers. Cottongrass also makes an obvious flower, which looks like a puffy white cotton ball, and bearberry is a low-growing bush that flowers in the spring, producing small berries that are eaten by wildlife – including bears – and also used as medicine. It's easy to overlook two of the most important plant species in the Arctic. Mosses are very common here, growing on moist ground and sometimes even underwater in shallow pools warmed by the sun. Sometimes moss even clings to rocks. The Arctic is also full of lichen, which can vary in appearance from tiny coral-like structures to a sort of "planty" crust on rock. Lichen is a very important winter food for caribou, which dig down through the snow to eat it, and it's actually made up of two types of plants growing together: algae and fungi. Another very important plant in the Arctic is the diminutive Arctic willow. This tiny shrub probably doesn't look like the willow trees you're used to seeing; it grows very close to the ground and has shallow roots that spread out sideways, since permafrost keeps the willow from growing a tap root down into the ground. Arctic willow is an important food for many Arctic animals, including caribou, musk oxen and Arctic hares. What Are Some Flowers Found in the Taiga? Maloney, Lisa. "Major Plants & Animals in the Arctic Tundra." Sciencing, https://sciencing.com/major-plants-animals-arctic-tundra-6402846.html. 24 September 2018.